AX Paris Animal Print Wrap Midi Dress is rated 3.8 out of 5 by 4. 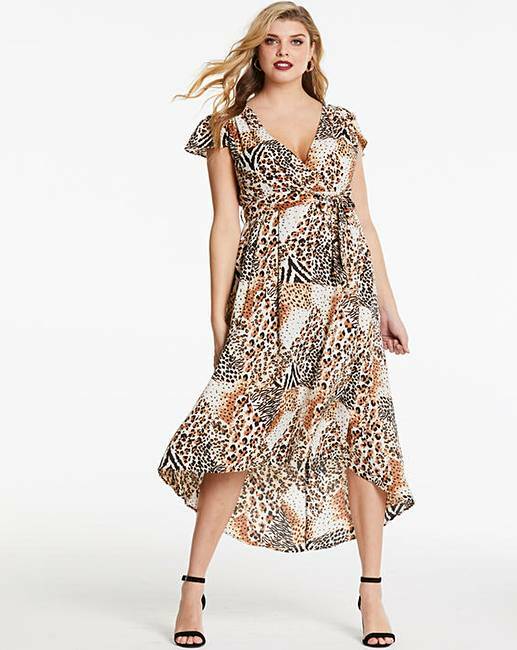 Look and feel amazing in this mixed animal print midi dress by AX Paris Curve. The flattering midi length combined with the dip back and tie waist are guaranteed to create a gorgeous look. Rated 4 out of 5 by Evey from Love this Dress Lovely Fit! Very Flattering style! Cant wait to wear on holiday! Rated 1 out of 5 by Charza from Disappointed OMG this dress is just the worst. I have contemplated getting it for a while but I was so disappointed when it arrived. It looked like I was wearing a bed sheet, I am a size 14 and it was so big on me. It was also badly fitted around the bust area, I am a 38DD and it was so baggy!! I am also 5"4 and the back of the dress touched the floor and the front was equally as long and not below the knee area as suggested in the picture. AX Paris are usually my fav from Simplybe so I was shocked at this piece. I sent it straight back.